Yesterday Emily Clark posted photos of her finished office space. I am so smitten with her new space! Another photo that had me at "hello" was this space that Carol posted on Facebook. 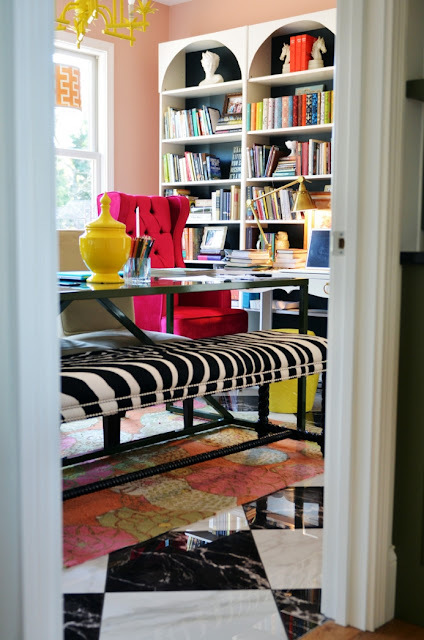 Finally another space I absolutely adore, is Edie from Life in Grace blog's work space. What I notice about these three spaces is the perfect balance of colour, patterns, and materials. These eclectic spaces are jaw dropping gorgeous! 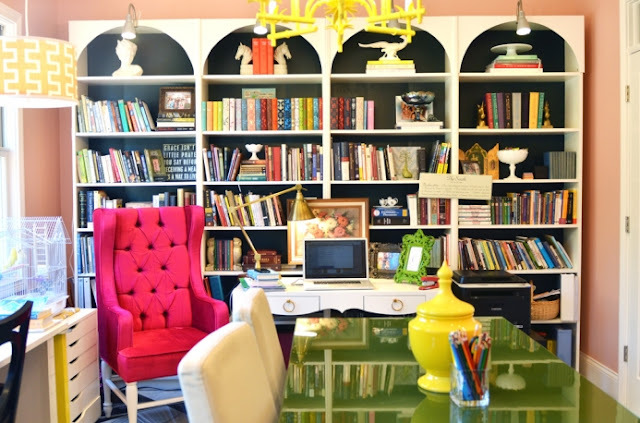 I think every office space needs a signature chair, fabulous wall of bookcases artfully arranged along with a mix of traditional, industrial and vintage and a bit of the unexpected thrown in! Only wish I had a office space to call my own. They are all so beautiful! I love how Emily's office turned out. Seriously who needs a dining room? I'd take that any day! Oh...I love these shots Barbara! I have been pinning photos of office after office as I prep myself for making over the little office I've managed to squeeze into a "corner" of my and my roommate's living space. Thanks for the fab inspiration! 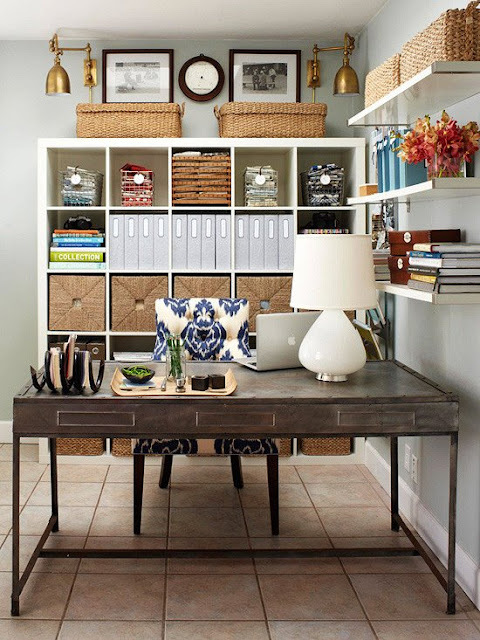 Truly lovely and I pinned a few of them for my home office file as well. My home office needs a revamp, I'll be painting or wallpapering this spring. Oh how I'd love an office to make my own- these are all gorgeous! I just saw Emily's office on her blog and all I could think was WOW. 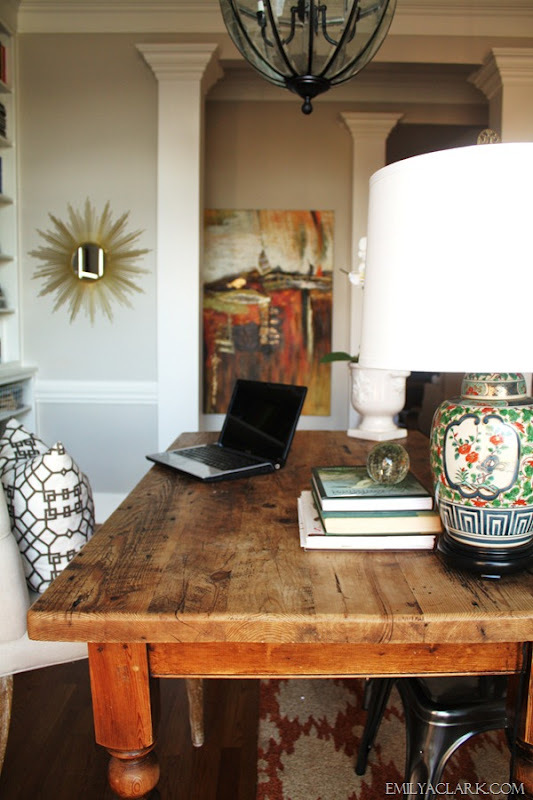 A dining room office is visible to one and all, but hers is so beautiful it only adds to the decor. these are all fantastic! Hope your week goes well ! Those offices look incredible. I am dreaming of the day, when I get to have an office all to myself. Emily's office is amazing! Love all the inspiration!! These are amazing spaces to work in and I agree with your list of perfect things for the perfect office. Especially a statement chair. It totally makes the space! You can totally tell that these spaces have been hand picked when designed. They each have such different eclectic personalities. I just love the look of the Marais chairs with the farm table. oh my - our office is NOTHING to look at. Only room I haven't decorated in the house (don't know why...maybe it will be on the list post-kitchen!) These are gorgeous inspiration shots. I would love to have all of these things in my office space! The oversized lantern in Emily's office is amazing. Perfect read for me today, as I'm feeling the need for an office revamp. Thanks for the inspiration to get on it! Also, sorry to hear about your husband's job. Will pray for you both. Hang in there! Such a fun mix in all of theses - I really love the use of an old, soulful table as a desk in the first. That space feels so grounded. Your blog provided us, the valuable information, to work on. You have done a marvelous job! Such a nice collection of pictures.It offers a great variety of office space. Wow! Those office spaces are really inspiring and I will get some ideas what will be the look of my office here in my house. Thanks for sharing it. Its really inspiring as well as very attractive.I like the themes of office spaces you have shared.I wished this kind of office space with such a nice themes in India.